Diagnosis of visceral leishmaniasis may require taking a blood sample and/or taking a biopsy from the bone marrow or splenic puncture to show the parasite. Diagnosis of cutaneous leishmaniasis will require a small biopsy or scrapping of ulcer. Diagnosis of mucocutaneous leishmaniasis requires a biopsy of the affected tissues. Biopsy samples are examined by microscopy, culture and other methods to look for the parasite and identify the specific kind of leishmania causing the ulcer. Blood: For making blood film/blood culture and serological tests. Bone Marrow: Biopsy material obtained by sternal or iliac crest puncture. Splenic Pulp: Biopsy material obtained by splenic culture. As the clinical presentation of visceral leishmanisis (kala azar) lacks specificity, confirmatory tests are required to decide which patients should be treated. Such tests should be highly sensitive (>95%) as VL is a fatal condition, but also highly specific because the current drugs used to treat VL are toxic. Ideally, a test should be able to make the distinction between acute disease and asymptomatic infection, because none of the drugs currently available is safe enough to treat asymptomatic infections. Moreover, such tests should be simple and affordable. Detection of reduction in the number of red and white blood cells and platelets (pancytopenia) in VL suspected clinical patients. This test is highly specific but sensitivity is very low. Aldedhyde Test (also called Formal Gel Test: FGT): Polyclonal hypergammaglobulinemia (the production of high titres of non-specific antibody) is detected in this test. Sensitivity of this test is poor, as low as 34%. In this test 1-2 drops of serum from a case of kala-azar is taken and a drop or two of formalin is added. A positive test is indicated by jellification to milk white opacity like the white of a hard boiled egg within 3 minute to 24 hours. A killed culture (0.1-0.2 ml) of a suspension containing 6 to 10 promastigotes per ml is injected intradermally. A positive reaction (an area of induration after 72 hours) is produced in cured kala azar cases 6 to 8 weeks after recovery and represent a delayed hypersensitivity reaction accompanied by cell-mediated immunity. The test is positive in African Kala azar but not in indian and mediterranean kala-azar and post kala azar dermal leishmaniasis. 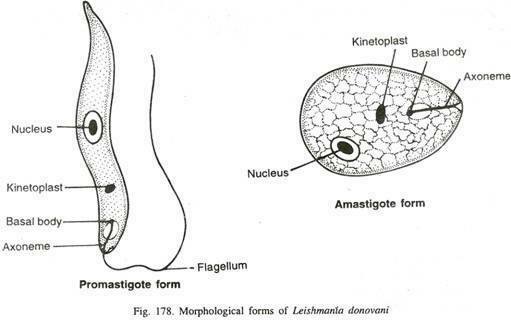 For the detection of parasite visualization of the amastigote form of the parasite by microscopic examination of aspirates from lymph nodes, bone marrow, or spleen is done. It is the classic confirmatory test for visceral leishmaniasis. Although the specificity is high, the sensitivity of microscopy varies, being higher for spleen (93% to 99%) than for bone marrow (53-86%) or lymph nodes aspirates (53-65%) . The detection of parasites in the blood or organs by culture or by using molecular techniques such as PCR is more sensitive than microscopic examination. Find about serological methods for the laboratory diagnosis of visceral lesihmaniasis in the link given below. It is a very nice presentation . I like it very much . I am a medical technologist in lab. I am working in icddr,b . I want to know more about the in vitro culture of L.D bodies . Would you help me ? I am sending my email address to you. I will be very glad to you . Thanks again your nice presentation .